How much is your old air conditioner costing you? Climate control for homes in Perth with it’s harsh summers can be quite costly for homeowners especially if you are cooling your home with an old air conditioner that may not perform as well as it once did, not to mention the expense of keeping an old system going. Keeping your home cool in summer can count for up to 40% of your energy consumption which is a big household expense but advances in air conditioning technology have greatly improved energy efficiency. Not only will a new Daikin or Panasonic Air Conditioner reduce your energy usage by 30-45% but you will have improved cooling &/or heating, reduced repair costs and the new units are not as noisy as their predecessors. Is it time for you to upgrade that old unit? Cableair will choose the perfect air conditioner for your needs. Call us now and talk to one of our consultants and see how easy it is to upgrade to better more efficient air conditioner for your home. Cableair are your Specialist Daikin Dealer here in Perth and we can help you to find the perfect Daikin Air Conditioning System for your home or business. Cableair will custom design a system for both new and established properties, we choose the best system to cool or heat your property efficiently and effectively. 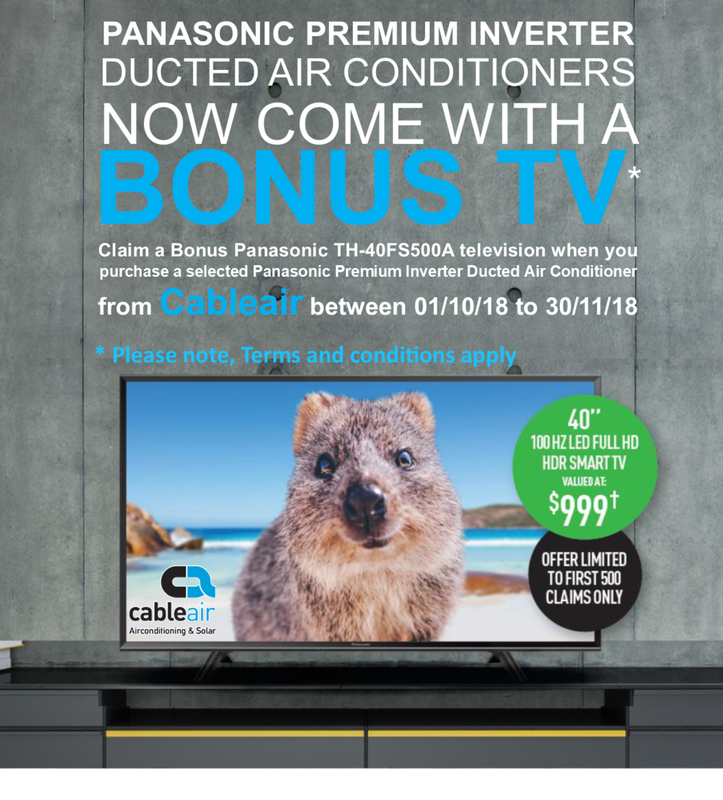 This September Panasonic are giving away Coles Myer Gift Card when you purchase your Panasonic Wall Split System Air Conditioner from Cableair. Give Cableair a call to find out how you can get a Coles Myer Gift Card. Receive an EFTPOS Card worth up to $200! From the 1st of March until the 31st of July 2018 when you purchase a selected Panasonic Wall Split System Air Conditioner from Cableair Panasonic will give you an EFTPOS card up to the value of $200. call Cableair on 6142 2056 to find out the details. 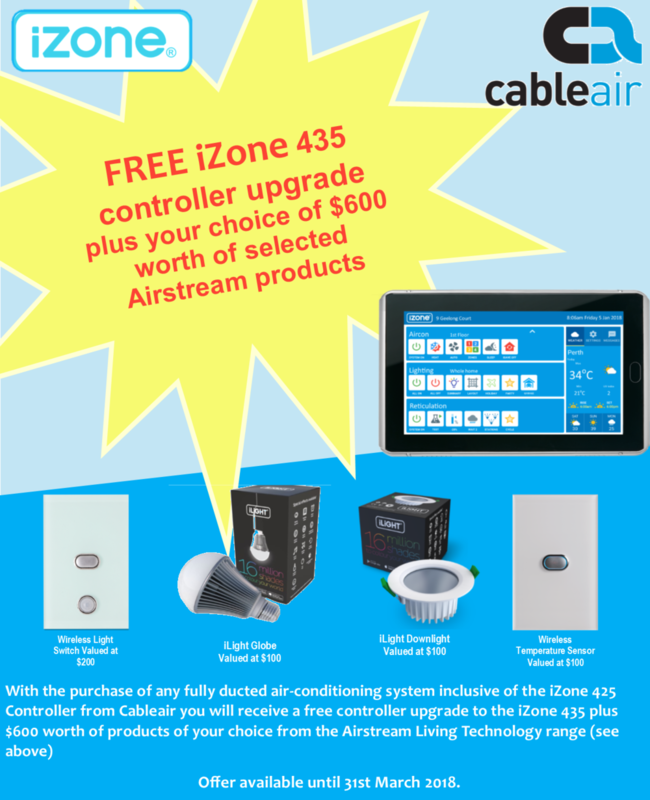 With the purchase of any fully ducted air-conditioning system inclusive of the iZone 425 Controller from Cableair you will receive a free controller upgrade to the iZone 435 Nexus Touch screen. Plus we are offering you $600 worth of selected products from the Airstream Living Technology range when you purchase a fully ducted air conditioning system from Cableair. Choose from the iLight Globes, iLight Downlights, Wireless Temperature Sensors or the Wireless Light Switches all able to be fully integrated with your iZone Nexus Touch screen! Offer available until 31st March 2018. The New iZone 425 Nexus Controller Has Arrived! Any home can be a smart home, it doesn’t matter whether you’re building a new home or renovating an established home. At Cableair we can show you how iZone will instantly make your home more liveable. With the arrival of our new iZone 425 Nexus Touch screen you can control the air conditioner, dim the lights, water the garden, boil the kettle or close the garage door. The iZone 425 Nexus Touch Screen Controller is a stylish, custom designed home automation controller not a cheap tablet. 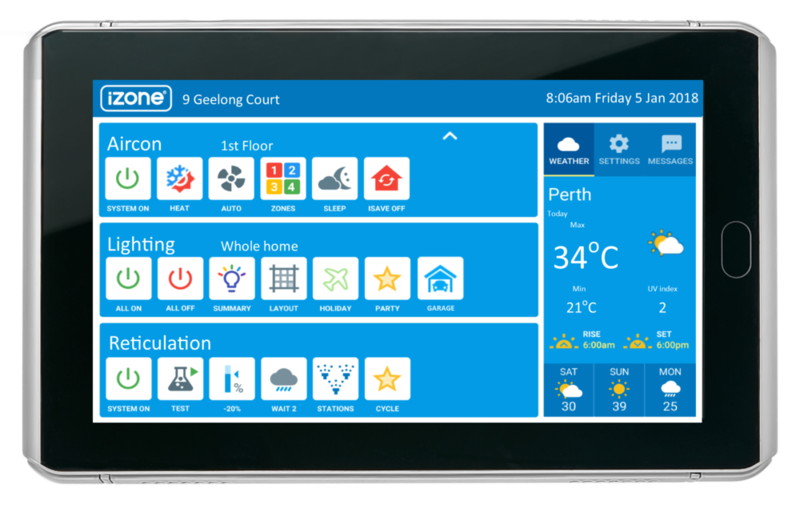 With a built-in temperature sensor for zone or AC unit control, a 7" screen with the ability to display the Air Conditioning, Lighting, Garage Door and Reticulation all on the home screen, the iZone 425 is also available in 4 colours (White, Silver, Black, Gold). Automatic alerts and messages will alert you of any faults on your retic’s solenoid valves or field wiring plus lets you know which programs are running. 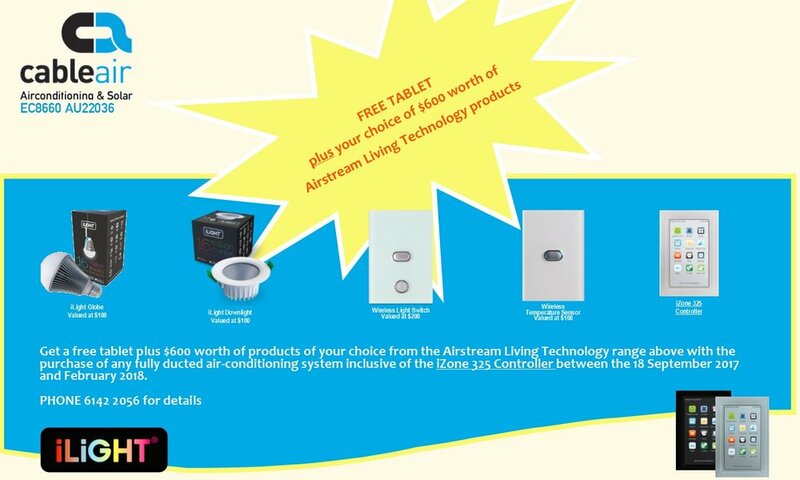 Cableair and Airstream have a fantastic offer for our clients who are installing ducted air conditioning in their home. With the purchase of your iZone 325 controller you will receive a Tablet and up to $600 worth of selected Airstream Smart Lighting products! email or call us on 6142 2056 to take advantage of this pricing.